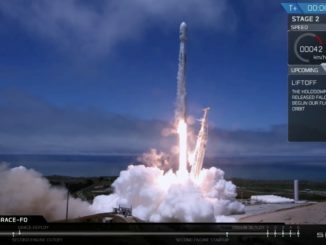 The new rocket, dubbed the Next-Generation Launcher for now, would offer the U.S. Air Force a third option to launch the military’s communications, navigation, early warning and intelligence-gathering satellites. “The intention is that this will be a new family of launchers developed and qualified as a public-private partnership with joint Air Force and industry investment, and available for satellite launches as early as 2020,” said John Steinmeyer, director of strategy and business development for Orbital ATK’s launch vehicle division. Only SpaceX’s Falcon 9 rocket and ULA’s Atlas 5 and Delta 4 launchers are currently certified to fly the Defense Department’s most sensitive and costly payloads. But ULA is retiring the base, medium-lift version of the Delta 4 around 2018, and a new Vulcan rocket with U.S.-built main engines is scheduled to debut in 2019, eventually replacing the Atlas 5 in the early 2020s. At that time, ULA’s Vulcan rocket and SpaceX’s Falcon 9 and Falcon Heavy vehicles will likely share the military’s space launch load. The Pentagon requires two independent rocket families to ensure its satellites have a ride to space if one booster is unavailable. Steinmeyer said Orbital ATK will only go forward with its new rocket development if assured of Air Force funding support, but he said the company’s launcher design has “moderate” development costs. The Air Force awarded contracts to Orbital ATK, ULA, SpaceX and engine-maker Aerojet Rocketdyne earlier this year, helping seed the design and testing of new rocket engines to wean the U.S. launch industry off of Russian propulsion systems, such as the RD-180 engine launching on the Atlas 5’s first stage. The agreements are structured in a cost-sharing scheme. For its part, Orbital ATK pledged $31.1 million to go with the Air Force’s initial investment of $46.9 million. Orbital ATK’s contract with the Air Force has a maximum value of $180.2 million, and the company’s own funding of the propulsion work could go as high as $124.8 million, assuming all contract options are exercised, according to the Defense Department. 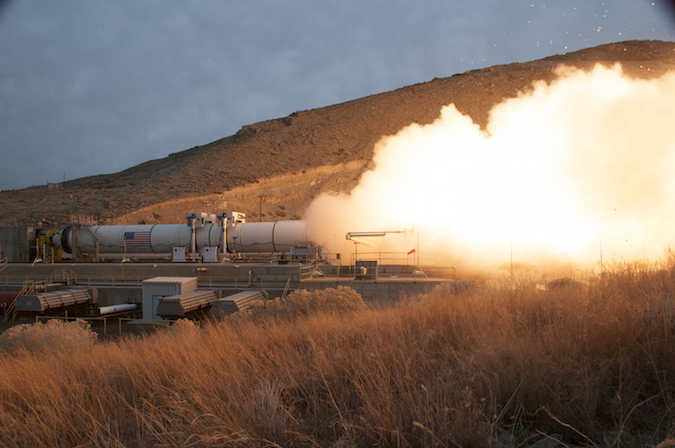 Orbital ATK chairman and chief executive David Thompson said earlier this month that the company will decide next year whether to proceed with the Next-Generation Launcher program. “If the market indicators and the product performance continue to move in a favorable direction, (it) could lead to a decision some time about this time next year or little later relating to the remaining work to actually build and test the vehicle,” Thompson said May 5. No U.S. company currently offers a kerosene-fueled rocket engine in the same performance class as the RD-180. ULA’s Delta 4 rocket is powered by a hydrogen-burning RS-68 engine manufactured by Aerojet Rocketdyne, and SpaceX’s Falcon 9 rocket uses a cluster of nine kerosene-fueled Merlin engines to produce the thrust required for takeoff. “The dollar value that we are requesting from the Air Force to go forward would be substantially less than others have stated is required for their RD-180 replacement activities,” Steinmeyer told reporters Tuesday at the Space Congress 2016 industry conference in Cape Canaveral, Florida. He declined to share Orbital ATK’s cost projections for the Next-Generation Launcher. Orbital ATK officials have previously acknowledged the new rocket concept, but Steinmeyer revealed details of its design for the first time this week. The three-stage rocket would be made of two solid-fueled lower stages, each made in-house by Orbital ATK, and a cryogenic third stage consuming liquid hydrogen and liquid oxygen. The engine for the third stage would be the BE-3U powerplant, a derivative of the engine Blue Origin currently flies on its New Shepard suborbital rocket. The basic version of the Next-Generation Launcher would have a two-segment Castor 600 first stage, topped with a Castor 300 second stage motor, which is essentially one segment of the rocket’s first stage, according to Steinmeyer. The solid-fueled motors are similar to the solid rocket boosters Orbital ATK and its predecessor companies built for the space shuttle and NASA’s Space Launch System. But the new rocket’s motors would use pre-packed propellants inside composite cases, which are lighter than the metallic steel casings flown on the shuttle and SLS. That development of the lightweight casings is one focus of the Air Force’s initial funding award to Orbital ATK earlier this year, Steinmeyer said. 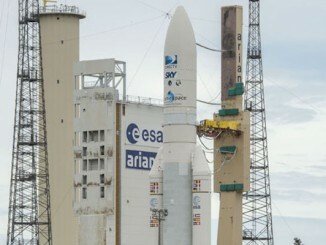 The two-segment Castor 600 first stage could be lengthened to a four-segment version called the Castor 1200. “It’s a very modular design tailored to meet the full specturm of EELV launch capability, and by adding two additional segments to that two-segment first stage, in other words a four-segment first stage, we can meet heavy launch capability as well,” Steinmeyer said. Up to six strap-on solid rocket boosters — the same 63-inch-diameter auxiliary motors Orbital ATK is developing for ULA’s Vulcan and Atlas 5 rockets — could be stacked around the base of the Next-Generation Launcher. The BE-3U engine on the 5.25-meter diameter (17.2-foot) third stage would produce up to 120,000 pounds of thrust and fire multiple times per mission. A payload shroud spanning 5.25 meters (17.2 feet) in diameter will top off Orbital ATK’s proposed rocket. According to Steinmeyer, the basic intermediate-class launcher, without strap-on motors, can put about 12,125 pounds (5.5 metric tons) into geostationary transfer orbit, the destination for most commercial and military communications satellites. “This new vehicle concept leverages existing flight-proven elements,” Steinmeyer said. Designers plan to put the rocket together inside the Vehicle Assembly Building at NASA’s Kennedy Space Center, then roll it out to launch pad 39B. NASA selected Orbital ATK in April to begin negotiations to take over one of the high bays inside the mammoth assembly building. Orbital ATK would share pad 39B with NASA’s Space Launch System, a huge rocket the agency is developing to send astronauts into deep space. 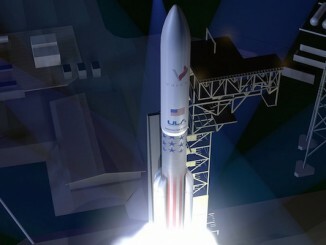 But the SLS will not fly more than once per year, leaving the launch pad available to other users most of the time. The new launcher shares some design elements with the Liberty rocket concept pushed by ATK, one of Orbital ATK’s predecessor companies, after the retirement of the space shuttle. The Liberty launcher would have had a large solid-fueled first stage resembling the shuttle’s booster and a cryogenic upper stage based on Europe’s Ariane 5 rocket. The rocket now proposed by Orbital ATK would use different propulsion systems, but like Liberty, it would be assembled in the VAB and blast off from pad 39B. Orbital ATK has an eye on renovating Space Launch Complex 2 at Vandenberg Air Force Base, California, for a West Coast launch site for the Next-Generation Launcher. A facility there would access polar orbits unreachable from Cape Canaveral. Steinmeyer said the Air Force is expected to request proposals from industry for a complete launch vehicle design, and Orbital ATK will likely be up against ULA and SpaceX for government financial assistance. It is not clear how many companies the Air Force could support with funding. Unlike SpaceX and Blue Origin, Orbital ATK is a public company, and Steinmeyer said development of the Next-Generation Launcher will require some level of government funding.